Cool Tabs allows you to embed your campaign directly on a webpage, blog or microsite. This feature has many advantages, such embeding your social media campaign on your website, attrackting clients and leads, offering discounts to your users or displaying it on any online site, not only Facebook or the campaign's microsite. Embed your Campaign on your Website. Create yor campaign if you haven't done it yet (it's necessary to get the url, even if the campaign is empty). 3. Go to the "Include the campaign on your site" section. Change the height and width to adapt it to your own website, copy the code and paste it in the place of your website you rather. 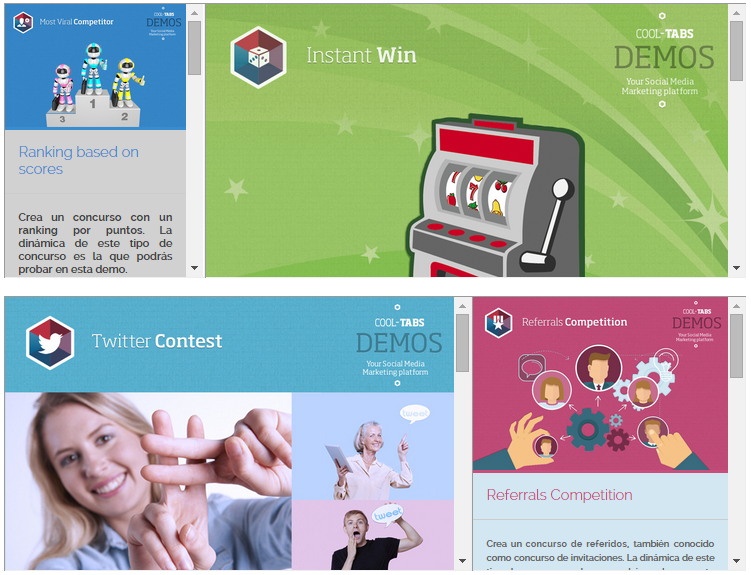 You can embed the landing of your campaign, the entry form or quiz or the participations list gallery. 4. ¡Ready! Check out the result. Our apps adapt to the space you want to save to embed your campaigns. You just need to indicate the size of that space on the iframe. The authentication to participate in the campaign will be the one you've chosen in the section "Campaign login". The campaign will be visible for all those people who visit the website. If you want to recommend the users who visit your website to follow your social profiles, you can activate the option. A pop-up will show up. This feature is available for our Cool Promo Cool Promo White Label apps.